You and your special someone are tying the knot, yay! Whether it&apos;s eloping on a secret rendezvous or planning an elaborate ceremony for hundreds of your family and friends, there is no place quite like Las Vegas to make it official. 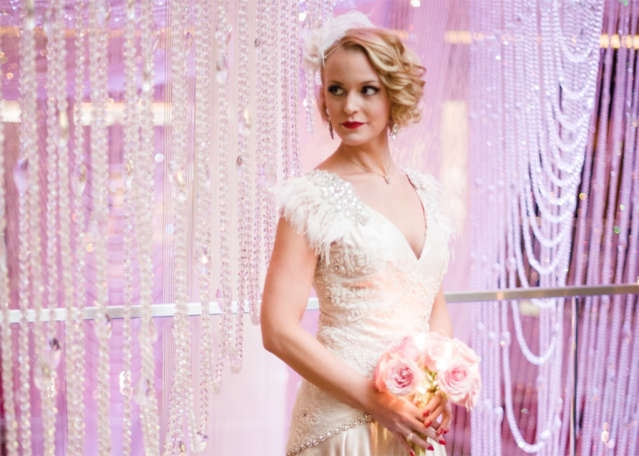 Before you say "I do," we vow to show you why you should have your wedding in Vegas. 1. Get married literally anywhere, anytime and any way you want. Whether you&apos;re wanting your first kiss as a married couple to be in front of the Bellagio fountains, in Red Rock Canyon or 550 feet in the air on the High Roller, Vegas is the place you can get an experience totally custom to what you and your fiancée want on that special day. 2. Your planning experience will be easy and convenient. 3. Bachelorette party? Reception? Honeymoon? We&apos;re a one-stop wedding shop. Convenience, efficiency, a straight up obsession with this city—whatever the reason, Vegas is the perfect spot for all your wedding festivities. 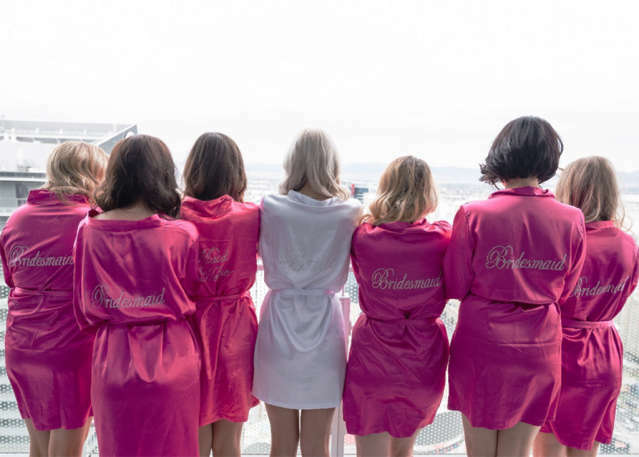 Those trying to plan their bachelor or bachelorette parties, reception, honeymoon and more will be happy at the ease of setting up these events in Vegas. Plus, guests only have to pay for travel once to experience the whole shebang. Not to mention bachelor and bachelorette parties in Vegas aren&apos;t famous for nothing. 4. The celebrity chef of a 5-star restaurant could be catering your reception. Anything is possible in Vegas, especially when it comes to a couple of our favorite things: food and weddings. MGM Grand offers the Joël Robuchon’s Parisian Terrace package. This includes a private dining room where the wedding festivities continue with a five-course dinner menu from L&apos;Atelier del Joël Robuchon, the Three Michelin Star restaurant at the hotel. 5. Vegas is the ultimate destination wedding. One of the best days of your life doubles as a bucket list item. Take your guests somewhere they&apos;ve always wanted to go (or to return to!). What better place to celebrate your love than in a place specialized in having fun? There&apos;s also so much to do in Vegas that your guests can entertain themselves if needed, and this takes away that pressure of having to personally spend time with your guests at all moments. 6. Luxury is our middle name. But seriously, our specialty is in giving you the VIP treatment. Have visions of pearls, fountains, and the ultimate romantic oasis? 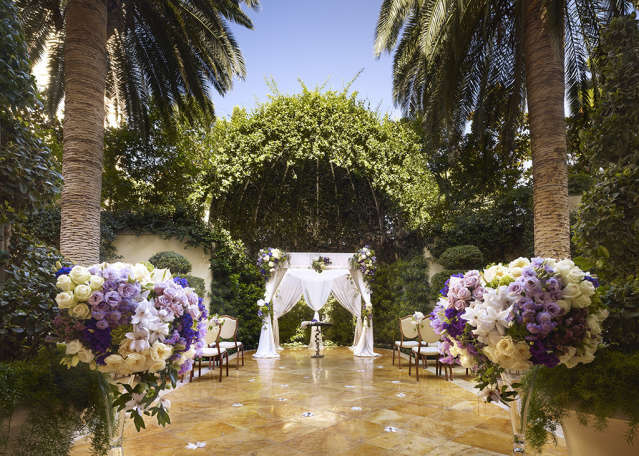 Say "I do" at the elegant Wynn, Caesars Palace, Four Seasons, Aria or The Venetian for extra luxurious accommodations. 7. Did someone say afterparty? We&apos;re the experts in all things nightlife. Once the reception winds down, we know exactly where to take the party. With all the different ways to celebrate, you definitely won&apos;t have a problem finding an epic afterparty in Vegas. A world-renowned DJ could be spinning in the same hotel where you exchanged your vows. 8. We have the best dress shopping EVER. Your wedding look just got upgraded. If there&apos;s one thing about Vegas it&apos;s that any brand, designer or style you can think of is most likely carried here. From Fashion Show to the Shops at Crystals, there are options for brides and grooms with all tastes and budgets. 9. Treat yourself to a little pre-wedding pampering at our world-class spas. You can&apos;t be ready to conquer a Vegas wedding if you&apos;re stressed. Wind down at Sahra Spa & Hammam (The Cosmopolitan), The Spa & Salon at ARIA (Aria), The Spa at Encore (Encore) or QUA Baths & Spa (Caesars Palace) for a little pre-wedding R&R. These spas all have private spa suite options as well as salon services to best accommodate your wedding group. 10. A wedding in Vegas is something your guests will forever talk about. Vegas is undoubtedly a unique choice for a wedding destination, so you can count on your special day being a memorable one for all of your guests as well. And the photo opps? Unreal, and they will be unlike anyone else&apos;s you see on Facebook. The best weddings are (and always have been) Vegas weddings. We&apos;re here to make your day not only incredibly special, but exactly how you&apos;ve always imagined it going down. Start planning your Las Vegas wedding now. Oh and while you&apos;re at it, you should start planning that Vegas anniversary trip as well.